« Help Kerry Rhodes choose his Suicide Fantasy Football team! The status of Beanie Well's knee is the major injury concern for the Cardinals heading into the season opener against the St. Louis Rams. Kent Somers of the Arizona Republic believes it’s less likely that Beanie Wells will participate in Sunday’s season opener against the Rams, which Somers claims wouldn’t be such a bad thing. Wells once again sat out of practice for the third straight day Thursday. The Cardinals certainly shouldn’t need Wells to defeat the Rams, but it would be devastating if the injury lingers, a point that Ken Whisenhunt addressed. “What concerns me is I don’t want this to be something in Week 12, or Week 13 or Week 14 that [Wells is] having issues with,” Whiz said. Based on that concern, it seems Whisenhunt will be cautious with Beanie this week. 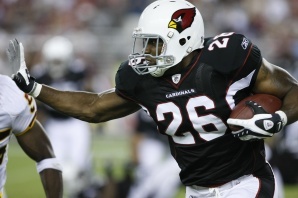 If Wells doesn’t play, the Cardinals still have a perfectly healthy Tim Hightower and LaRod Stephens-Howling. Jason Wright participated in light practice and is still recovering from a toe injury, but is reported to be recovering rapidly and is expected to be available. 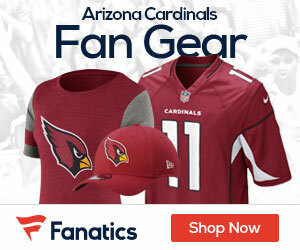 The Cardinals still haven’t decided on their punt returner, though Darren Urban of the Cards’ official website speculates that it will go to one of two rookie WRs, Max Komar or Andre Roberts.